Hosting happy hour soon? 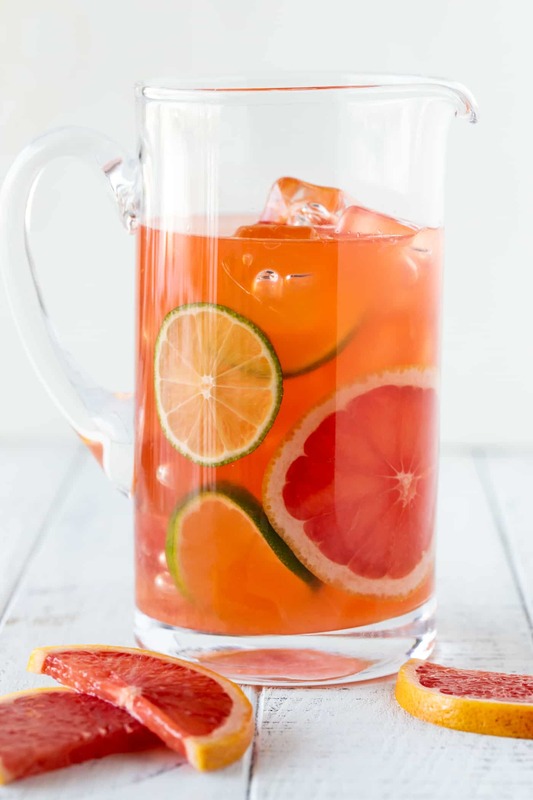 Brighten up your menu with a pitcher of these refreshing (and not to mention gorgeous) Grapefruit Aperol Cocktails! The dead of winter can drag on. Especially when you live in the Midwest. So we decided to take things into our own hands to brighten our moods. We started with some fresh grapefruit juice and added a little Aperol along with a healthy pour of tequila. The result? Refreshing Grapefruit Aperol Cocktails. 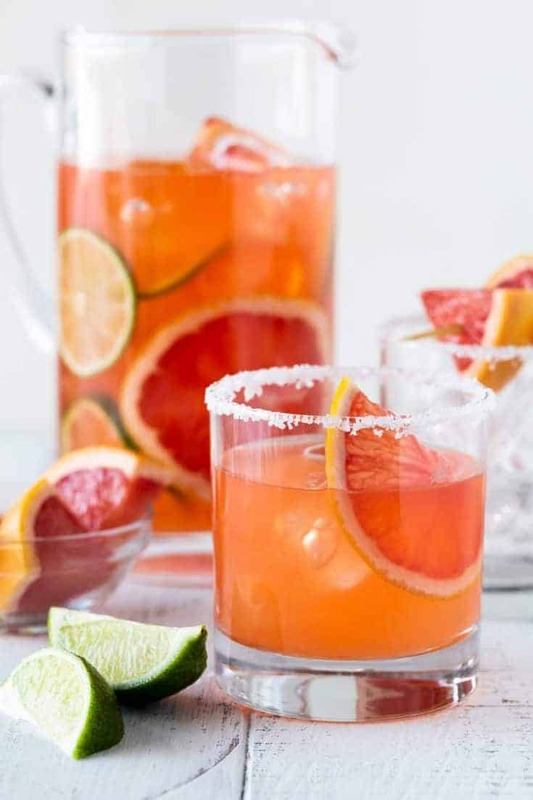 Fresh grapefruit juice is key to these Grapefruit Aperol Cocktails. Trust me. It’s worth it. Don’t mess with the premixed bottled stuff; the flavor just isn’t the same. Tip: If you don’t want to spend the time juicing grapefruits, fresh-squeezed grapefruit juice is readily available from most grocery stores. What else do I need to make Grapefruit Aperol cocktails? 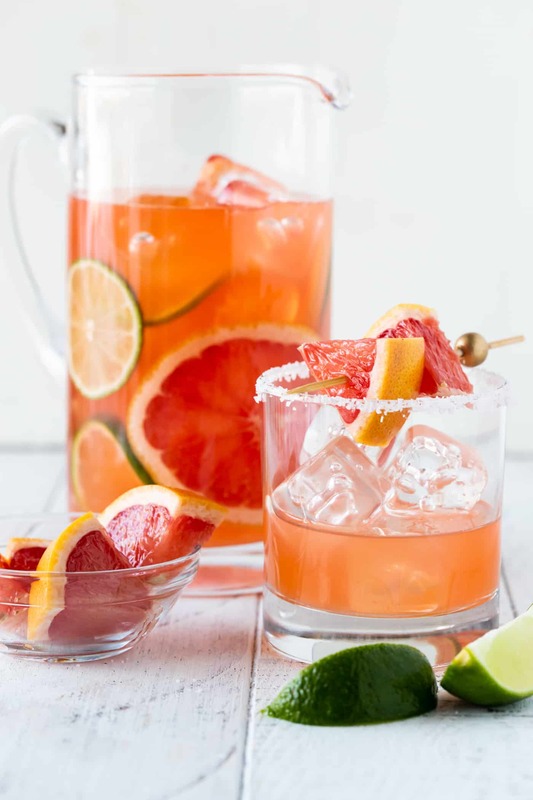 The liquors you need for this refreshing sipper are Aperol, triple sec and tequila. In addition to the grapefruit juice I just mentioned, you also need some lime juice and simple syrup. Does this combination of ingredients sound familiar? Since tequila is the main alcohol in this drink, you could almost call these Grapefruit Margaritas. After all, it’s basically a twist on the classic margarita. We just mixed a few extras into it. Does it matter what kind of tequila I use for this batch cocktail? You can use your favorite but we used a silver tequila to let the bright pink color of the grapefruit juice and Aperol shine through. Doesn’t that gorgeous color just instantly brighten your mood? Aperol is a popular Italian aperitif. It has a bit of a bitter flavor, so it’s not something most people drink straight up or on the rocks. But the low alcohol content of Aperol makes it the perfect mixer for cocktails. In this recipe, the tangy flavor of Aperol blends perfectly with the winter citrus flavors. Looking for other ways to use that bright orange bottle of liquor? Try some of our other popular Aperol cocktails like this Aperol Gin Cocktail or mix up a batch of these Bourbon Aperol Cocktails for your bourbon-loving friends. 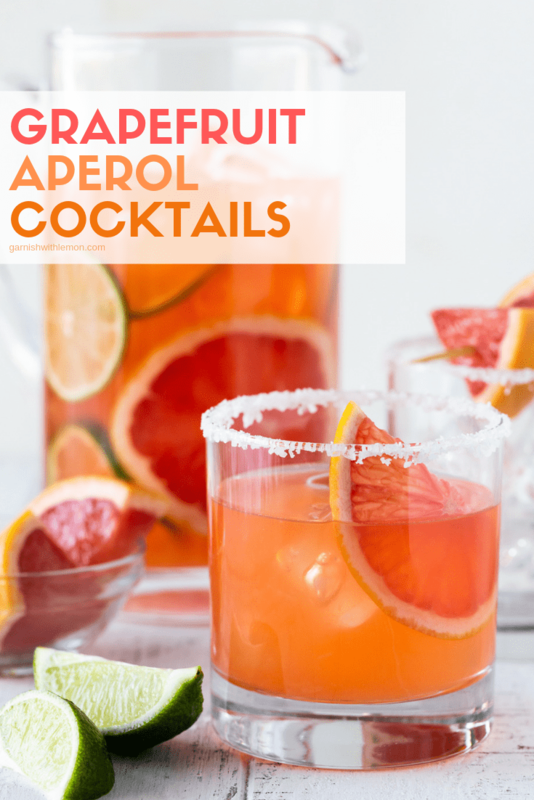 These Grapefruit Aperol Cocktails are the perfect excuse to have friends over! So go ahead and schedule that overdue happy hour. Good cocktails are even better when they are shared with good friends! You can never have too many ways to drink tequila! Check out some of our other favorite sippers. Light and refreshing, these Grapefruit Aperol Cocktails taste similar to grapefruit margaritas with a bit of an edge. Perfect for happy hour! Fill a pitcher with ice and add tequila through simple syrup. Stir well to combine. Place salt on a small plate. Run a grapefruit wedge around the edge of the glass and dip in salt on plate. Fill glasses with ice and and pour cocktails into prepared glasses. Garnish glasses with fresh grapefruit and lime slices, if desired.